The house originally had a small laundry room, but by the time we bought the house, it was completely destroyed by opening it up with the bathroom, painting(!!) over the original "bubble" ceramic time, and boarding up (WHO DOES THAT?!) the exterior door I'm assuming they walked thru to hang their wash on the line. Since we are taking out a powder room and adding a second full bath, the original location of the laundry room will be the guest/kid bath. The boarded up door will become a glass block wall, which will serve as the window in this room as there isn't any. We considered a window instead, but the missing Roman brick on the exterior would be obvious and drive me nuts. Instead, we're glass blocking the old doorway and embracing that it was an exterior door at one time. The new laundry room is going to be a new interior room in our garage. We have about 42" of space to use, and it will be directly in front of one of our cars when you pull in the garage. Currently, there is an old utility sink and built in cabinets, so we are going to add walls and enclose it to use. This room will also serve as a mudroom, as anyone entering through the garage will walk through this space before entering the kitchen. With such a tiny space, we decided to stack our washer & dryer. We also decided to add some narrow storage for shoes, keys and hats/mittens. I LOVE the image on the left, but we don't have room for the sink, so my inspiration is the middle image, from Young House Love. They have about 36" here, and ours will be 42", so our shelves will be a bit longer. Same general idea, though. We don't have tons of laundry "stuff". We use the same bottle of detergent for just about everything, and I plan to store things about the washer/dryer in the cupboards. 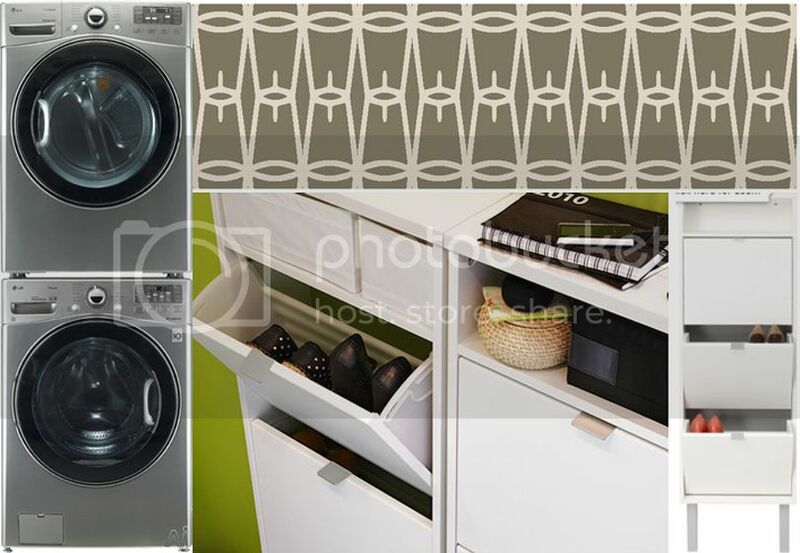 Our washer and dryer are new (below, left image) and a dark, metallic gray. We scored a sweet deal at Sears on Black Friday! As far as decorating this space goes, I'm totally digging the stripes, but I'm not sure it's the right room to do stripes. The bead board is adorable as well, but doesn't match the style of this house. We plan on doing some sort of color on the walls in here, just haven't decided on what yet. I am quite certain we will need a long runner rug in this space, and we've already purchased two of these shoe organizers from IKEA to put on the wall. They are only 7.5" deep, and will be perfect for shoes, hats & mittens, our car keys, phones, etc. Plus, they were only $60 each, so affordable storage in our small space. I'd love to do a bold color (orange, perhaps?!) on the walls, and use some graphic elements (rug, artwork) on the walls. I imagine the built in shelving around the washer/dryer will be wood, which will match our kitchen, which is adjacent to this room. I'll keep you posted!